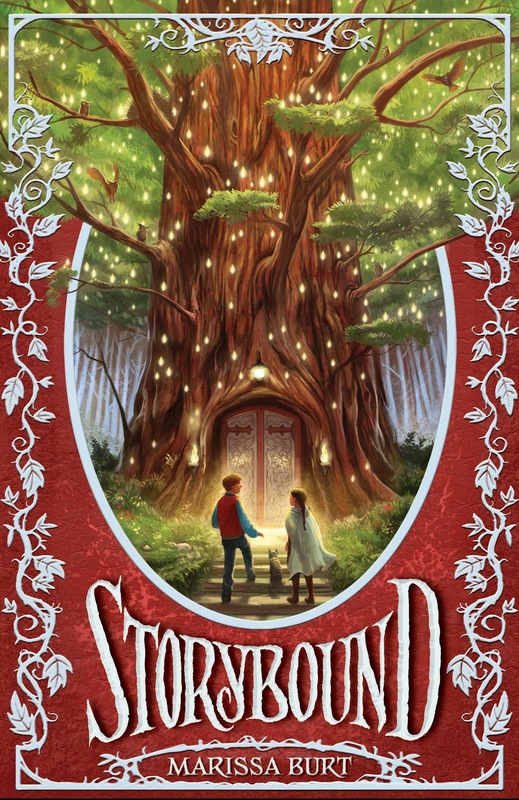 The first thing you should know about Storybound is that it has a sequel. Yes, yes it does. I did not know this when I started reading it and I didn't start figuring out that a sequel was likely in the works until the last few chapters. I still thought the author might pull out a rapid closure to the story but on the last page I was fairly certain. (Ha!) After I finished reading, I Googled to find the release date of Book #2 (Story's End) and it is slated to be released in "early 2013." I guess that's not too long to wait. I guess. As I mentioned last week, I picked up Storybound on a whim during a trip to Powell's Books. I had some birthday money to spend (there, of course!) and I felt like taking a risk with something. So I headed over to the Middle Grade section (best bet for me!) and found this one right away. The cover art caught my eye at first, and then the description on the back reeled me in. I read the first page to make sure the writing wasn't going to annoy me and I thought it would be a winner. And it is. Mostly. I'm not totally sure what to make of it, to be perfectly honest. I would most liken Storybound to Inkheart , by Cornelia Funke. The major difference being that in Inkheart the storybook characters are magically read out of the stories and into our world and in Storybound the main character, Una, is written into the Land of Story. Personally, I think Funke's writing style is superior to Burt's and there is greater clarity of thought in Inkheart . I sometimes felt a bit lost as to where Burt was going with her story as I don't think she connects the dots as well. 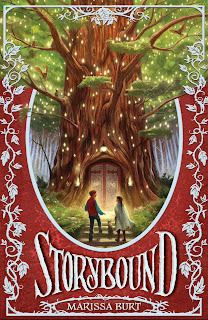 But that is not at all to say that I didn't enjoy Storybound - because I did and very much! It is very clear that Burt loves stories and when someone loves stories, you can almost always find ways of connecting to what they are saying. The protagonist in Burt's tale is twelve-year-old Una, who was orphaned by her parents when she was a baby. As far as she knows, they abandoned her and left her to be raised in the foster care system. When we meet her, she is living with an older lady who cares more for her cat than for children. Una finds escape from life through the books she reads. One day she is magically and unexplainably written into a story and it is up to her to find out why she was written it before she is killed and the world she was called into, Story, is destroyed. Upon arriving into Story, Una immediately meets Peter who is in training to be a hero. The world of Story is filled with characters we are familiar with as well as characters in training. The young children attend school to find out their gifting and then are classified as villains, heroes, etc. and they go on to live out the stories which we Readers read. There are also different districts in Story (such as fairytale, moderns, etc.). It takes a little while for Una (and the reader of this book) to wrap their mind around this land which Burt has invented but the read is very pleasurable and I didn't at all mind the wait. "This isn't a book. It's just an exam. Don't you see? You've been Written In to our world!" He ran his hands through his brown hair. "Professor Perregrin talked about it once in Backstory class. Something about how WIs had a special purpose. The Muses were the only ones who could Write people In. And I know they brought WIs here to help them, but he never said - "
Una seized on his words. "Brought here? Where is here?" Peter rubbed his forehead. "This is the land of Story. I guess you must be from the land of Readers. That's where the old WIs used to come from, I know that for sure. What I must remember is what happened to them after the Muses broke their - "
Just who the Muses are is unveiled over time, as is the history of Story and what Una's purpose there must be. Because it is a story which unveils itself slowly, I'm going to be careful here not to give spoilers. The reason I'm not sure that I can classify this book is as an ultimate winner is because I can't even really tell you what the message behind Storybound is ultimately supposed to be. Burt definitely feels that no book should be banned; all books should be available to whoever wants to read them. She and I would agree in saying that books hold and offer great knowledge and are excessively important in shaping how a person thinks and will act in this life. I would guess that she likes history. At one point one of her characters makes the statement that all "children should learn their backstory" as it would help them act and react well in the future. I agree with that. She seems to like clear villains and heroes and I liked that also. Mostly, all I can conclude is that this is a clever idea for a story and that while I may not feel like it is remarkably well done, I like it well enough to recommend it. It's fun. It's clever. It's diverting. And yes, I have every intention of reading the sequel. The reason I tend to like Middle Grade fiction is because it's light-hearted, doesn't involve teenage romances, has a spirit of adventure, and is clean. Plus, the authors are kindly making their middle grade stories longer which makes you feel a little more like an adult while reading them. (Ha!) Storybound fit the bill for everything I was after, and came in at a nice 403 pages. (Remember though, it's Middle Grade fiction so there is plenty of spacing making this a very quick read. It would probably be a 250 page adult book.) Over all, I really liked it, as I say. It proved a safe risk - my favorite type! Sounds very intriguing! That cover art is beautiful. That sounds like a fun little read. I, on the other hand, am preparing to start Don Quixote (which I've never read) with my teens. I'm glad to know there is a sequel. I will hold off reading it until the sequel is out. I have issues with delayed gratification. Also, ever since...well, yesterday, I now have an urge to read Inkheart. Thanks again for your suggestions! I'm completely with you on middle grade fiction! It's becoming a favorite of mine as well. Sounds like a fun book. Might be good to read with my almost middle school student.